Copper repiping is a process of refitting existing pipes in a residence or business. The majority of pre 1970 residences or businesses were fitted with galvanized pipes (i.e. iron pipes coated with zinc) and will eventually require repiping. As galvanized pipes age, the zinc lining tends to erode allowing rust to form. 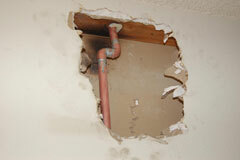 Once galvanized pipes begin to deteriorate, they need to be replaced. Most people prefer to replace galvanized pipes with copper pipes, (thus the term copper repiping) because copper pipe is lightweight, safe and durable, and does not rust. Additionally, because of its flexibility, copper holds up very well during earthquakes (very common in LA). When you observe any of the below symptoms, call E.Z. Roth Plumbing so we may test to see if your plumbing complications are due to eroding pipes, to which we will advise whether it is time for copper repiping. • Observation of yellow or rust colored water. • A foul odor emanates from the tap. • Pipes begin to leak. • There is a drastic change in the water temperature or pressure of a shower/fixture when another appliance (toilet, washing machine, etc) is being used simultaneously. • There is weak or inconsistent water pressure in a shower or faucet. If you are experiencing any of these symptoms or would like to prevent future problems, join the thousands of others in California who have repiped their home or office. Call E.Z. Roth Plumbing so we may run tests to see if issues are due to eroding pipes, to which we will advise whether it is time for copper repiping. Our professional plumbers have plenty of pipe replacement experience and are ready to assist you with your copper repiping needs. Copper repiping will solve problems and saves YOU money! Repiping is a system-wide solution that allows you to take a comfortable shower, wash dishes, water the lawn, wash laundry, and in fact, use all faucets and fixtures at the same time. Copper repiping gives you great water pressure throughout your home, clean and clear water, improves delivery of hot water, eliminates costly water damage repair bills, is environmentally efficient, and saves money on water lost to an inefficient system. Additionally, on account of its scientific components, copper (Cu) is also biostatic- that is it limits the growth of bacteria, so it guarantees a safer water supply.